On April 19th, 20th and 21st 2019 ten of Simone Stawicki's artmoney on the theme 'Strong Woman' will be shown at the art fair CPH Art Space 2019. You can see the works at the Artmoney stand at the fair. 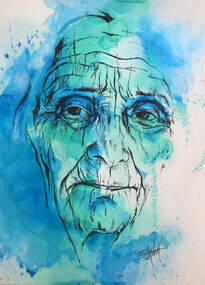 At Easter the exhibition 4Arts will take place for the eleventh time at the Synagoge in Weesp, The Netherlands. Four artists with four different disciplines show their work here. Every year these are four different artists. This year the artists are Edith van Eijden-Calis (ceramics), Anneke Spijker (wall hangings), Ans Westra (sculptures) en Simone Stawicki (paintings, mixed media). The opening will be on Saturday April 20th at 3 PM. On Saturday May 4th and Sunday May 5th you can visit the exhibition 4Arts XL at 't Oude Raadhuis in Beek en Donk, The Netherlands. This time six artists with different disciplines will show their work here. The artists are Edith van Eijden-Calis (ceramic), Sabine Heetebrij (photography), Marijke van Vlaardingen (ceramic), Marilou van Vlaardingen (mixed media), Ruud van Oorschot (wooden bowls and vases) and Simone Stawicki (paintings and drawings). The opening will be on Saturday May 4th at 4 PM. The exhibition 4Arts XL is open Saturday May 4th and Sunday May 5th from 11 AM until 5 PM. On June 1st Simone Stawicki will start the gallery 'de kleine toonzaal' (the small showroom). It is a small gallery with works of Simone Stawicki and a guest artist. The opening will be June 1st at 1 PM. Further information will follow. De kleine toonzaal is open on every first weekend of the month (Saturday from 1 PM until 5 PM and Sunday from 1 PM until 5 PM) and by appointment. Wednesday January 31st Simone Stawicki received the first Huizer Art and Culture Award handed by the mayor of Blaricum, Joan de Zwart-Bloch. The jury report from the Stichting Kunst en Cultuur Huizen (Foundation Art and Culture Huizen) states that Simone Stawicki is a leading artist in The Netherlands as well as abroad, that she evokes emotions in an impressive way and that she is a leading artist from the city of Huizen. Stawicki felt very honored with the prize and the jury report. The haiku's of Ben de Veth were an inspiration for Simone, so Ben and Simone joined forces and decided to publish a haiku collection. The haiku's are written by Ben de Veth and the visual art is made by Simone Stawicki. The book contains haiku's in Dutch, French and English. 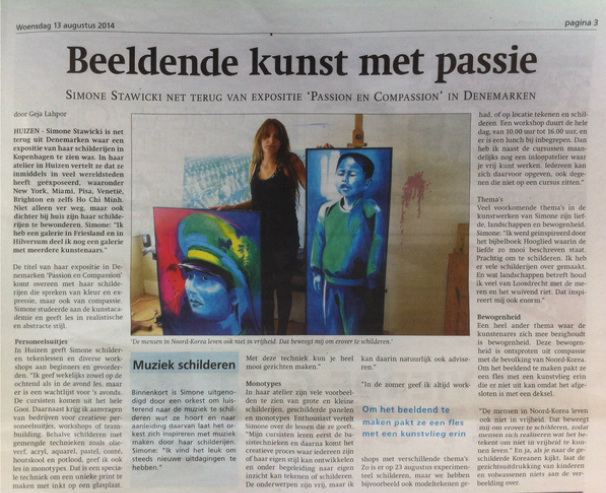 This year Simone Stawicki will have several exhibitions in Vietnam. Fifteen of her works on paper will be shown there. We will keep you informed. Two small pieces on paper are shown in the Huizer Museum. 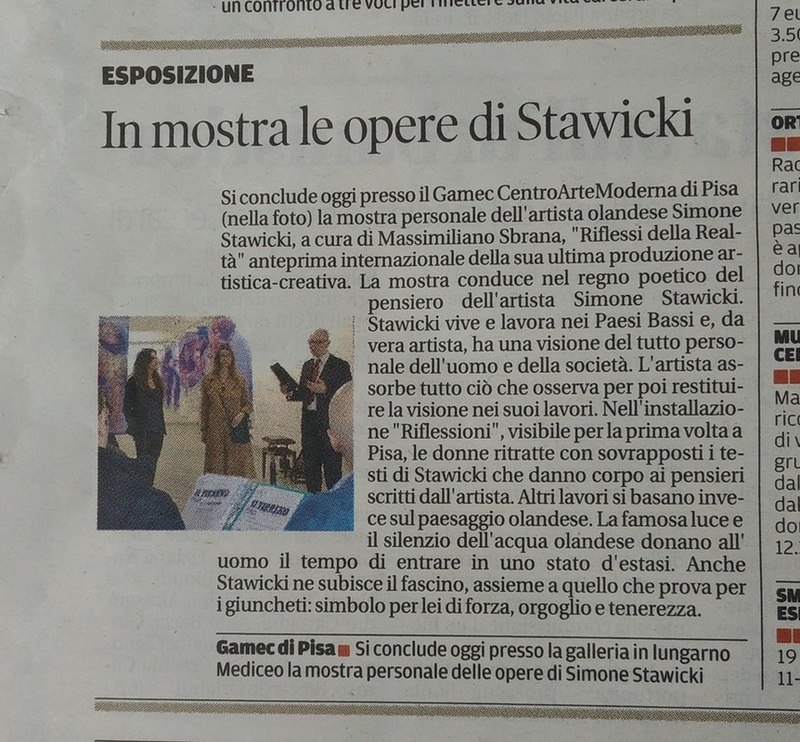 Simone Stawicki wrote a book 'A Course in Drawing and Painting'. The book is only available in Dutch. It contains 109 pages and tells you everything about the materials and techniques. The normal price is €27,95. Order it on www.stawicki.nl/cursus-tekenen-en-schilderen. In this video Stawicki shows you how a piece of installation 'Thoughts' is made by using water pistol and pastel. 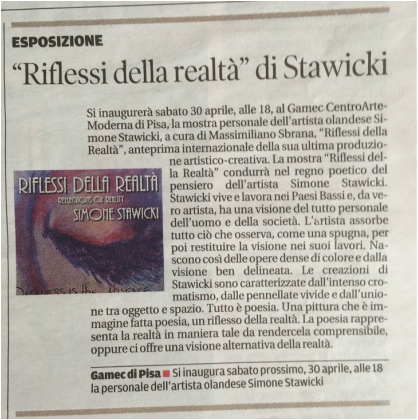 You can find Simone Stawick's latest news, photos and poetry on social media. Read her personal comments and see the development in her work. It also gives you the opportunity to place a comment. Besides the paintings, monotypes and mixed media of Simone Stawicki there are postcards of her work for sale, these cost only € 2, -. From now on you can also buy a birthday calendar with pictures of her work for € 12.50. There have been several articles in different newspapers lately. You can find these articles on my Facebook account. 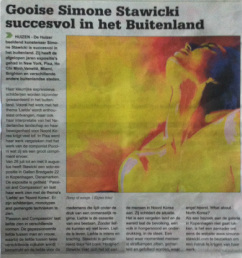 Het laatste nieuws over Simone Stawicki.